Summer is here - It's time to get your grill on and enjoy your friends and family in a cabin! As you already know, Blue Ridge offers many activities for enjoying the Summer season such as horseback riding, tubing, canoeing, swimming in Lake Blue Ridge or the Toccoa River, whitewater rafting the Ocoee River, fishing, and more! But, did you know Blue Ridge has its own beach? Yep! 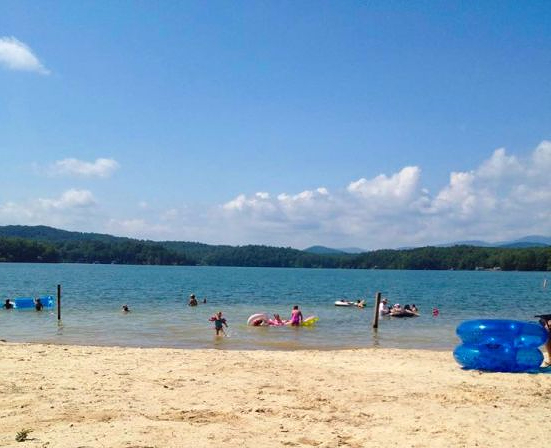 One of the best kept secrets in our county is Morganton Point Beach, located on pristine Lake Blue Ridge. Admission is $5 for the day to park and enjoy the gorgeous setting by the lake. The beach offers space for sun bathing and entering the water as well as large Native Oak trees that shade picnic tables perfect for lunch and snacks as you enjoy this lake side venue. Book now for Fall Getaways! October and November are filling up fast! Call now or to reserve your fall vacation and see the amazing Autumn colors paint the rolling mountains.